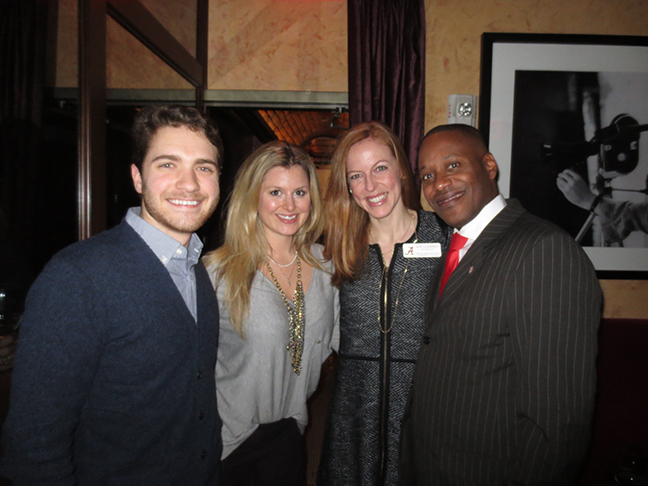 NEW YORK -- Nearly 70 tri-state area alumni celebrated the holidays at the Greater New York Chapter's 2014 Holiday Party at Grape & Vine. Hosted the chapter's annual holiday celebration for the first time, the Jade Hotel in Greenwich Village provided a charming atmosphere for UANYC members to connect with each other one more time before the New Year. Chapter members also and enjoyed the annual opportuniy to re-connect with University dignitaries including Calvin Brown (Director of Alumni Affairs), Jimmy Warren (National Alumni Association President), Dr. Shane Sharpe (Dean, University Honors College) and Dr. J. Michael Hardin (Dean, Culverhouse College of Commerce). © Copyright Greater New York Alabama Alumni Association, ALL RIGHTS RESERVED.